There’s nothing like a little (or a lot) of coral to punch up your summer weekend! Not only is it one of my favorite colors when it comes to beauty (I wear Revlon’s Blase Apricot lipstick year-round), but I’m crazy about it in my wardrobe as well. 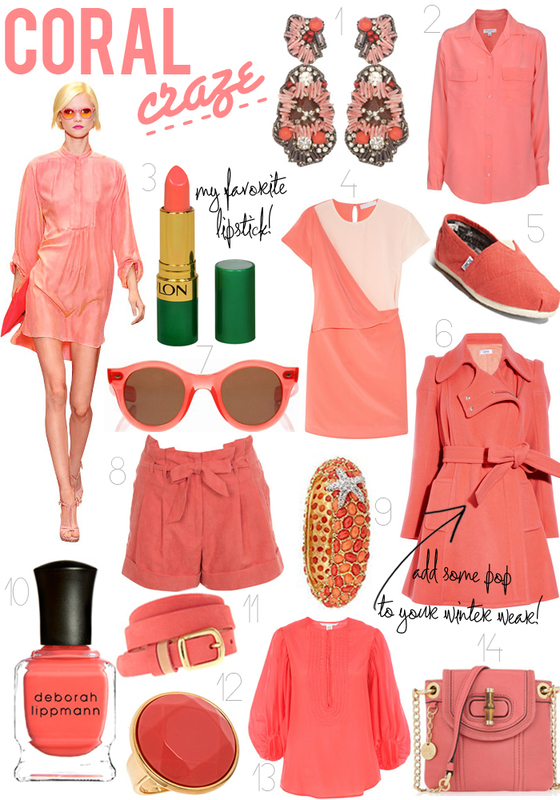 Being that it’s another shade of pink, it’s no surprise that I love coral so much! I will have to check out that lipstick and I LOVE all the rest of your picks! Great ideas for all things coral! Love the DVF blouse. I absolutely love every single thing. I've been looking for high heeled pumps in this color, but had zero luck. These are some gorgeous other choices though! Obsessing over so many of these items: Milly bag, Sonia Rykiel coat, linen Toms, Richard Nicoll dress – I need more coral in my wardrobe! Bradley- you always do the best collages. I am dying to learn how to edit like you did with that model. Nice work- as always. got a similar trench coat, but that winter coat looks amazing! Maybe need to get that!!!! I am a new reader to your blog but I just wanted to tell you that I love the layout and color scheme! Simply perfect! ooh – I love the lipstick and the toms! Thanks for all the sweet comments here! So happy to hear that you all like what you are seeing! Those are some amazing earrings!